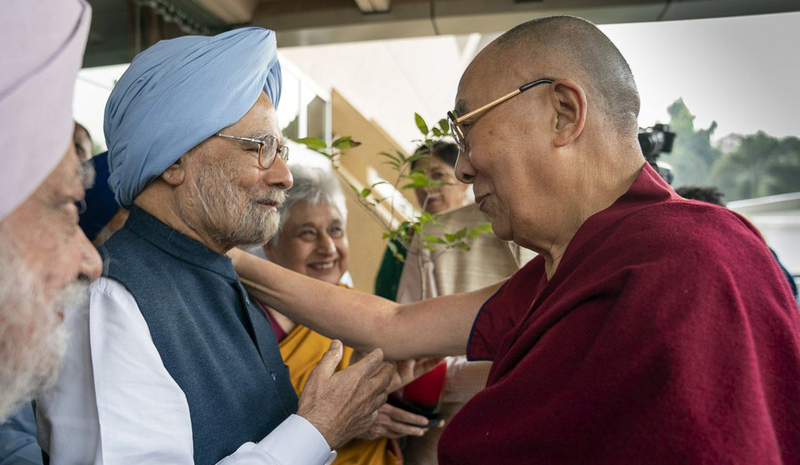 (TibetanReview.net, Nov12, 2018) – The Dalai Lama on Nov 10 took part in the inaugural event in New Delhi for the launch of year-long celebrations marking the 550th anniversary of the birth of Guru Nanak, the founder of the Sikh religion. Those who joined him included India’s former Prime Minister Dr Manmohan Singh as the President of the event-organizer Bhai Vir Singh Sahitya Sadan (BVSSS). BVSSS was established 60 years ago to commemorate and further the work of Bhai Vir Singh, a poet, scholar, and theologian of Sikh revival. In his speech the Dalai Lama called Guru Nanak, who he confessed he did not know fully about, a product of the Indian tradition of the practices of cultivating a single-pointed, calmly abiding mind (shamatha) and the insights derived from analytical meditation (vipashyana). These practices, he pointed out, had led to a cumulative understanding of the workings of the mind and emotions leading to their transformation and the achievement of peace of mind—inner peace. He called the lack of karuna or compassion the root of the problems besetting this world which is riven by all sorts of conflict, including in the name of religion. He said that while religion remains relevant today, more attention should be paid to the ancient Indian knowledge of the workings of the mind and emotions, with its advice about tackling destructive emotions and achieving a kind of emotional hygiene. Earlier, the event’s keynote speaker, eminent art historian BN Goswamy, explained how much Guru Nanak had emphasized the importance of truth which he had said never grows old and brings illumination. The event concluded with the Dalai Lama and Dr Manmohan Singh joining to plant a sapling that the BVSSS Director, Dr Mohinder Singh, pledged to nurture. The Dalai Lama next visits Japan for a series of religious teachings, a dialogue with scientists, and a public talk, beginning Nov 12, for 10 days. He is expected to be back in Dharamshala on Nov 25.